On March 19, Uzbekistan will celebrate International Potato Day for the first time. Environmentalists are asked not to buy wild primroses! The campaign "Attention, primroses!" Takes place is not the first year. 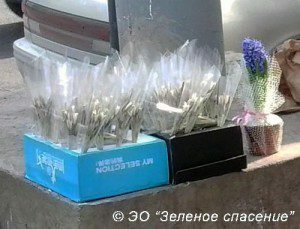 And every year we ask Kazakhs not to break, not to sell or buy wild flowers! Tajikistan ranks first among the countries of Central Asia in terms of the reserves of water resources. And in terms of hydro-energy reserves - it has one of the first places in the world. On March 1, 2019, a conference of Syrdarya regional party organization of the Ecological Party of Uzbekistan was held in the meeting room of the Syrdarya Regional Department of Agriculture in Gulistan. The emergence of invasive predators and competitors was the main cause of extinction in the modern era. Did you know that the giant “sea devil” - manta ray - has the largest brain among all existing fish? Or that the dugongs, sometimes called "sea cows," are more closely associated with elephants than whales or dolphins? The Ecological Movement of Uzbekistan congratulates you on holiday - International Women's Day on March 8. On March 1, 2019, a conference of Bukhara Regional Party Organization of the Ecological Party of Uzbekistan was held in Bukhara.